Dimensions: 6-1/4 x 4-7/8 x 4 in. 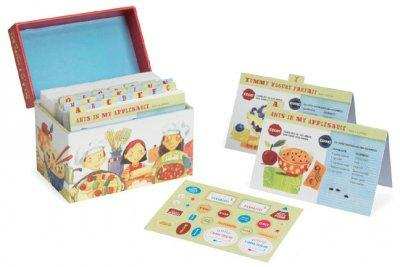 26 recipe cards, 26 blank cards, 2 sticker sheets, for ages 3 and up. From Ants in My Applesauce to Zany Zucchini Sticks, these 26 recipes offer young chefs a wide variety of hands-on cooking adventures. Each recipe has clear, simple steps that children will find easy to follow and in the process, they'll learn about the foods they enjoy and practice skills like following directions and measuring, too. Developed by a former chef who is also a mother and a cooking teacher, these tasty (but still healthy) recipes have been kid tested and perfected. They're sure to offer plenty of fun times in the kitchen for young chefs and their families!